Figure 11.13 Micmac camp near Sydney, Nova Scotia, 1857. Photo by Paul-Émile Miot. Important changes in the relationship between Aboriginal and colonial peoples began in the 1830s. As early as the mid-18th century there was an appetite in Britain and in some of the North American colonies for the abolition of slavery, but not much came of it. We have seen how Governor John Graves Simcoe made some modest moves in this direction in the 1790s. In 1807 Parliament in London passed the Slave Trade Act, which put an end to the legal trafficking in slaves across the empire. In 1833 Britain passed the Slavery Abolition Act. The rise in support for abolitionism in the 1830s pertains to Aboriginal people because it was a landmark in a movement that came to be known as humanitarianism. Generally, British opinion shapers and political leaders were in the process of developing a more egalitarian perspective generally. In part this sprang from the acceptance of individualism as an ideal. The link between individualism and humanitarianism may seem like a contradiction, but the connection was simple: Enlightenment-era individualism stressed the autonomy and value of the individual. If everyone had an equal moral significance then, regardless of race or culture, colour or religion, they were entitled to equivalent treatment or at least respect. This principle played out in many different ways when it came to Aboriginal people globally, but in British North America it mostly took on the flavour of “improvement” and “civilization” of Native societies, one individual at a time. After the War of 1812 and the end of Aboriginal power around the Great Lakes, there appeared growing enthusiasm on the part of Euro-Canadians to “improve” Aboriginal peoples by settling them in colonial-style villages, modifying their housing styles, teaching them farming and animal husbandry, setting up European-style schools, and enforcing Euro-Canadian-style gender relations. Missionary activity in British North America had been largely neglected since the Conquest, Protestants being evidently less interested in the task than were the Catholics. But from the 1820s on Protestant missionary activity accelerated in Upper Canada and the Maritimes, as it did throughout the rest of the British Empire. By the 1840s the missionary movement had made it all the way to the West Coast. Set in that context of humanitarian thinking and expanding missionary interest in Aboriginal societies, the timing of Britain’s mid-decade Select Committee on Aborigines is important. The Select Committee conducted a study of the treatment and condition of Aboriginal peoples around the empire. What it found, of course, was that settler societies everywhere dispossessed Aboriginal peoples of their lands and their means of making a living. Where Aboriginal lands were at the disposal of indigenous individuals or the community as a whole, there were also sales and further alienation of lands being made. This created a potential contradiction. On the one hand Euro-Canadian reformers and Tories alike favoured private ownership of land and implicitly the ability of a landowner to sell whenever they got a good price; on the other hand, the loss of tribal lands in this manner stood to undermine the economic self-sufficiency of Aboriginal communities and so should be stopped. The urge to protect Aboriginal peoples from what (imperialist authorities took to be) their own irresponsibility won out. The Crown Lands Protection Act (1839) was thus an important step along the road to converting Aboriginal peoples from neighbours and sovereign peoples into disempowered subjects whose affairs were held in trust by the state as a guardian. This marked the arrival of a new kind of paternalism, one in which Aboriginal peoples had much the same rights as children and usually fewer than Euro-Canadian women. The Act prevented Aboriginal landowners from selling off property to newcomers by effectively stripping Aboriginal communities of their title. And people without land in this era were people without citizenship. The colonial authorities had decided to act in what they thought were the best interests of Aboriginal people, who would be guided into citizenship via assimilation. But colonial officials were never certain in these years as to whether and how they could act. Until 1860, responsibility for Aboriginal affairs resided with the British government assisted by personnel on the ground in the colonies to advise and administer matters directly. In other words, the responsibility was in Britain but practical authority was in the field. Funding lines were, moreover, confused and complicated. Aboriginal influence, too, was at a low ebb. Key decisions were being made far away, in London, while day-to-day decisions were being made locally in the colonies for which the imperial regime might not take ownership. Under these circumstances it is easy to see how Aboriginal issues became disregarded or poorly addressed by British North America’s mid-century generation of politicians: it was neither their responsibility nor was it made pressing. Herman Merivale, permanent undersecretary of the Colonial Office in London, 1847-60, developed the concept of regional approaches rather than an overarching policy applying to all. This meant almost as many policies as there were colonies: in the Maritimes, it was one of ‘insulation’ of the Amerindians; in the Canadas, ‘amalgamation’; in Rupert’s Land and on the Northwest Coast, support of HBC administration, which in the latter case was tempered by [Governor James] Douglas’ concern for Amerindian rights. In other words, in spite of good intentions, centralized imperial administration was not coping very well with the myriad local problems of colonial government. Neither did goals always synchronize: where the Colonial Office was concerned with rationalizing imperial administration in economic terms, in the colonies it was all too evident that Indians no longer fitted into imperial plans and that programs to ameliorate their situations would be costly. Attempts at enforced change were not getting very far, and the voices of the Natives themselves either were not being heard or were being ignored. These conditions were well understood in British North America. The Bagot Commission of 1842-44 looked at the situation through a humanitarian lens and called for a unified Indian policy, reminded government of its obligations under the Proclamation Act of 1763 regarding the integrity of Aboriginal land title, identified the need for more thorough and proper land surveys, and advocated for a program of economic cultural change that would see Aboriginal peoples become successful ranchers and farmers. There was more, as well, but little of it got funded so the point soon became moot. There were two forces at work within newcomer society that pulled in opposite directions. First, there was an administrative and fiduciary obligation to Aboriginal communities and individuals to protect their interests, and also a vested interest in reducing Aboriginal dependence on government resources. Chronic poverty would be a burden on both Aboriginal and newcomer communities. Second, however, was the mindset of a developing colonial frontier, the belief that land and resources were there to be developed and that development and settlement of newcomer families produced revenues and wealth for all. There was, too, a bias in the marketplace: competition was good, but not competition between Aboriginal peoples and newcomers, not competition that the Aboriginal participants might win. The outcome was poor for Aboriginal peoples. Increasingly their numbers were too small to set a limit on Euro-Canadian expansion. They were pushed to the side or sent elsewhere. The Mi’kmaq fell on particularly hard times as traditional resources were either depleted, negatively impacted by the timber industry frenzy, or no longer accessible because of newcomer intrusion. On Prince Edward Island, the 1767 lottery of lands had neglected to include any provision for Aboriginal residence. In a blink, all indigenous peoples on the island were rendered landless. The patchy and inefficient efforts to settle Prince Edward Island bought the Mi’kmaq some time, but it wasn’t until 1859 that anything like a reserve was established. Generally, the response of the Maritime colonies to Aboriginal hardship was to treat the Mi’kmaq much as they would paupers, with handouts. Nova Scotian and New Brunswick lands that were notionally allocated to the Mi’kmaq were not properly surveyed and, therefore, never registered; squatters moved in time and again. Efforts to take up farming were a failure; moreover, newcomer efforts to force the Mi’kmaq to become farmers were culturally insensitive, unrealistic given the land situation, and oblivious to the costs entailed in starting a community agricultural enterprise (as opposed to a family farm). In the 1840s the Mi’kmaq chief and elder Paussamigh Pemmeenauweet (1755-1843) made a direct approach by correspondence to a young Queen Victoria. Joseph Howe played a leading role in producing the Nova Scotia Indian Act of 1842 thereafter, the thrust of which was guardianship of a “helpless race.” At this time there were thought to be fewer than 1,500 Mi’kmaq and Howe was predicting their extinction within two generations. Successive administrations took the view that to invest in schools or economic salvation of the Mi’kmaq was to throw good money after bad. From the 1820s and accelerating in the 1830s, similar processes were underway in the Canadas. Mohawk claims to the whole Ottawa Valley were brushed aside as incompatible with the goal of building a thriving farming colony. Setting aside lands for hunting grounds — as opposed to ploughing them up for wheat — was antithetical to the dominant colonialist views of the day. Although governors and colonial administrations made an effort to observe the principles of the Proclamation Act of 1763, they did so without enthusiasm. Extinguishing Aboriginal title was often a matter of imposing the outcome on the Native communities effected, not negotiating a sale or rent. Lands set aside for Aboriginal communities – known as “reserves” — begin to show up at this time. The immigrant and fertility explosions among the colonial peoples in the Canadas finally caught up to more remote arable lands. Resistance by Aboriginal peoples was difficult because of continuing population declines among Natives, successive loss of land title (which left Natives with little in the way of bargaining chips), and the elimination of historic allies in the face of American westward expansion. That’s not to say resistance did not occur. The Mica Bay War on Lake Superior in 1848 stands out as an example. The territory in question was entirely owned by the Ojibwe and none of it had been surrendered. Heedless of this fact, the government issued mining licences to non-Aboriginals. The Ojibwe responded by burning down a mining operation. Aboriginal leaders argued for annuities and royalties on resources tapped in their territories; the Province of Canada was only prepared to pay for land cession. The outcome was the Robinson Treaties of 1850 — one on Lake Huron and the other on Lake Superior — which included a purchase payment plus annuities in exchange for the entire foreshore of Lakes Superior and Huron. Aboriginal people would enjoy unfettered Aboriginal access to hunting and fishing in the region, which was thought to be reasonable given the limited agricultural potential at the edge of the Canadian Shield. Manitoulin Island emerged as settlement hub for native peoples as a result. It is important to add that Métis peoples who made claims at this time (and whose claims were supported by the Ojibwe leadership) were disregarded by the Canadians. It is also worth noting that Aboriginal interest in farming was regarded as marginal, regardless of what plans and ambitions Native peoples themselves might have. Aboriginal people in the Maritimes and the Canadas complained that they were being characterized as “lazy” and dependent but that they couldn’t cut a tree on their lands without the permission of a bureaucrat. Worse, no one seemed interested in stopping colonists from taking timber from native lands. Half-hearted attempts were made to address this question. Legislation in the 1850s tried, with mixed results, to protect timber stands on Aboriginal reserves from the incursion of logging camps. The logging industry, however, was something of a wild free-for-all and this initiative was badly policed. The laws lacked teeth. Another act that aimed to further protect the property of Aboriginal peoples in Canada East in 1851 would come to have very important long-term ramifications. The legislation attempted to define who could be regarded as an “Indian.” Initially very broad and inclusive, it was revised soon after to include categories like status and non-status, and to limit the extent to which Aboriginal communities could identify who qualified for membership. The patrilineal traditions common in European societies were impressed on Aboriginal identity so that the offspring of a registered Indian father inherited status while the children of a non-Aboriginal male married to an Aboriginal woman were, simply put, not Indians. Humanitarianism had become much more paternalistic, protective, and assimilationist, a trend that is most clear in the Province of Canada’s An Act to Encourage the Gradual Civilization of the Indian Tribes of the Canadas (1857). The goal was to enfranchise adult Native males one at a time, thereby removing their Indian status; monitor their moral character (as part of a Christianization initiative); and turn them into independent landowners (at the expense of reserve land). In the 20 years that followed only one Aboriginal person in the united colony took up this offer. At the heart of this there were different goals. Aboriginal peoples generally wanted to adapt to new circumstances. In some quarters — among the Mississauga, for example — there was real interest in farming and a willingness to indulge the newcomers’ enthusiasm for “model villages” made of European-style houses on reserves. Other Aboriginal groups like the Lenape (Delaware) had an ancient agricultural tradition of their own; they didn’t need to become farmers, they needed land. This was not, however, about assimilation into newcomer norms; this was about adapting as Aboriginal people to changing circumstances. But Euro-Canadians and Nova Scotians wanted Aboriginal peoples to assimilate. Schooling and farm education were never, thus, about equipping Aboriginal peoples with the tools they wanted. These initiatives were meant to stop them from being Aboriginals. The 1860s would witness further changes in the relationship between British North America and the Aboriginal peoples of the northern half of the continent, most of which could be characterized as intensified neglect. The humanitarian moment had passed; belief in the impending disappearance of “the Indian” was becoming more general. There was confusion regarding Euro-Canadian responsibility to Aboriginal peoples, which arose from the belief that this was a matter for Britain to address. Modification of Aboriginal behaviour and living conditions — addressing visible issues — became the main thrust of “Indian” policy. Newcomer interest in Aboriginal land intersected with concerns that Aboriginal people might become landless through individual alienation of territory. The policy solution may have accelerated the process it intended to stop. 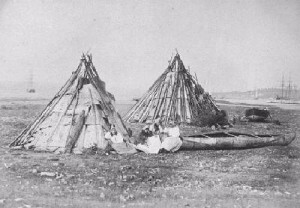 Micmac camp by Achim Raschka is in the public domain. 11.15 Aboriginal Politics at Mid-Century by John Douglas Belshaw is licensed under a Creative Commons Attribution 4.0 International License, except where otherwise noted.